Ford Motor Co. posted a strong second-quarter profit Friday but trimmed its U.S. sales forecast and predicted weaker results in the second half as the economy slowly recovers. The automaker surprised Wall Street, making $2.6 billion in the quarter as it continued to grab sales from rivals. Ford's U.S. sales rose 28 percent in the first six months of this year. That's almost double the pace of industrywide sales. It was Ford's fifth straight quarterly profit, and the No. 2 U.S. automaker predicted a strong 2010 and even better 2011. But it said it will make less money in the second half of this year because of seasonal plant shutdowns, costs for new product launches and rising prices for raw materials like aluminum. The automaker said U.S. sales, which hit a 30-year low in 2009, remain weak, with many shoppers not yet confident enough about the economy to buy new cars. Ford cut its forecast for total U.S. auto sales to a range of 11.5 million to 12 million. The company had predicted sales of 11.5 million to 12.5 million cars and trucks. Ford held its third-quarter production forecast steady at 1.27 million cars and trucks worldwide. Ford President and CEO Alan Mulally said the company is making money in the challenging environment because of strong new products and a leaner, global structure in which more vehicles around the world share parts. Shares of the Dearborn, Mich.-based company rose 41 cents, or 3.3 percent, to $12.50 in morning trading. 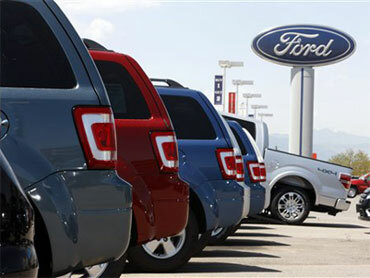 Helped by brisk sales of products like the Ford Fusion sedan and F-150 pickup, Ford has gained market share in the U.S. from Toyota Motor Corp., which was hurt by a series of safety recalls, and General Motors Co. and Chrysler Group LLC, who were tainted in some buyers' eyes for accepting federal bailout money last year. Ford ended the quarter with 17.2 percent of the U.S. market, up from 16.9 percent at the end of the first quarter, according to auto information site Edmunds.com. For the second quarter, Ford earned $2.6 billion, or 61 cents per share. That compared with net income of $2.3 billion, or 69 cents per share, in the same quarter a year ago. Ford beat Wall Street's expectations. Without special items, Ford earned 68 cents per share in the latest quarter, exceeding analysts' forecasts of 40 cents. Analysts don't factor in one-time items, including $229 million in charges related to the discontinuation of the Mercury brand. Ford's revenue rose to $31.3 billion, beating expectations of $29.8 billion. Ford paid off $7 billion in debt in the second quarter, most of it a cash payment to a United Auto Workers trust fund that pays retiree health care bills. The automaker ended the quarter with $27.3 billion in debt, which will cut its interest payments by $470 million per year. Ford's debt has helped finance a series of highly regarded new products, which has helped the Detroit automaker grab buyers' attention. Ford said it expects to end 2011 with more cash than debt. It now has $21.9 billion in cash, down from $25.3 billion in the first quarter due to debt repayments.